How does an image arouse a viewer’s interest? An important principle in telling a story is to intrigue the audience so that they want to hear more. This principle also applies to the graphic arts in terms of tantalising viewers with the hint of seeing something special so that they become engaged in looking. 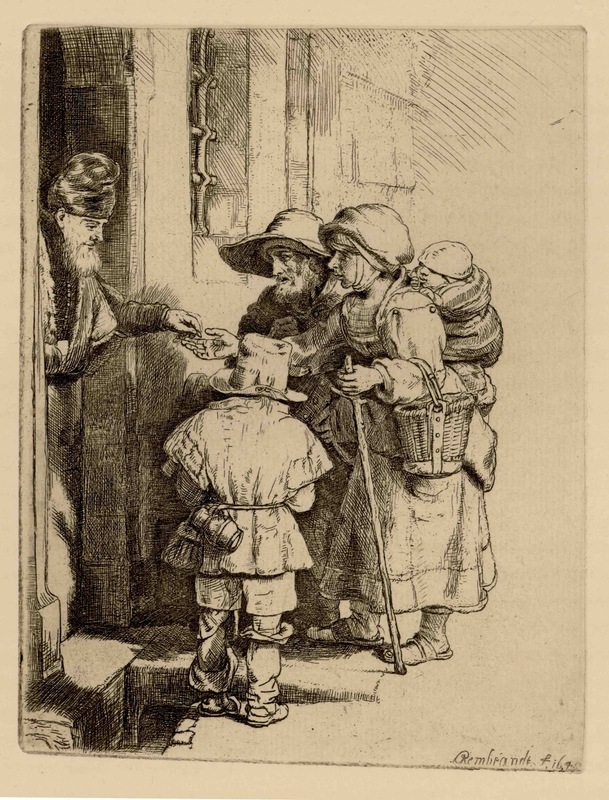 Rembrandt’s 1648 etching, Beggars Receiving Alms at the Door of a House (seen below), is a fine example of a simple approach to sparking viewers’ interest: the art of partly concealing the centre of interest. 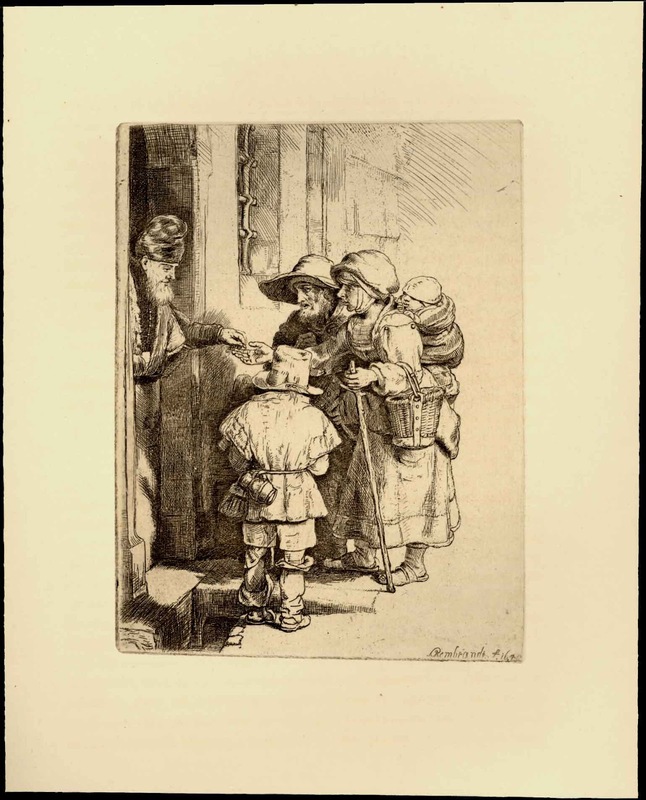 Here, the image of a family of beggars receiving alms from a figure in a doorway is enticing to examine closely for two reasons. The first is part of human instinct that any huddle of people is likely to arouse curious scrutiny to see what is happening within the group. Second, a group of figures is even more intriguing if there is a glimpse but not a clear view of what they are doing. The critical element in Rembrandt’s group of the figures is that we can see the figure in the doorway giving a coin to the lady but by clever design our view is a privileged one because the foreground figure blocks a clear view of the action (see detail below). This partial blocking of a viewer’s vision is the visual equivalent of a comma in a sentence that phrases and articulates the reading of meaning. 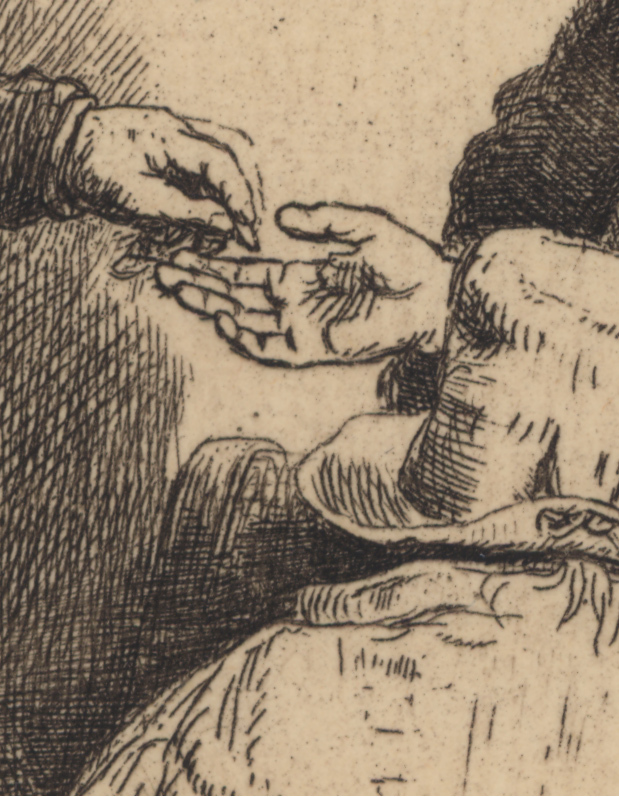 Burin and drypoint, signed and dated Rembrandt f.
Condition: pristine condition on laid paper. Rembrandt has added many other “punctuation marks” (i.e. pictorial devices acting like commas, dashes, brackets and full stops) to sustain interest and guide a viewer’s negotiation of meaning. 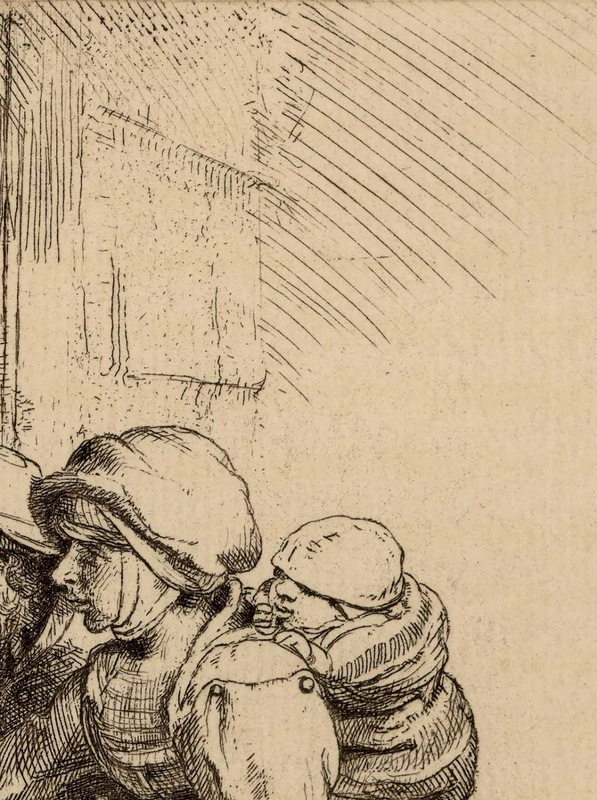 For example, the converging lines of the drainage channel to the left of the foreground figure (see detail below) draw a viewer’s attention to the group but this inward reading directed by the angle of the channel is interrupted at a pivotal point in the scene by the bridge stone at the doorway that is directly below the centre of interest: the gift of alms. Another device is Rembrandt’s use of freely drawn curved lines towards the upper right of the composition (see detail below). These lines focus attention on the group by marking a boundary on a viewer’s reading—the pictorial equivalent of a full stop in literature. Seen in conjunction with almost spherical arrangement of the figures these curved lines frame and tunnel our view on the charitable gift of the coin to the lady’s hand. 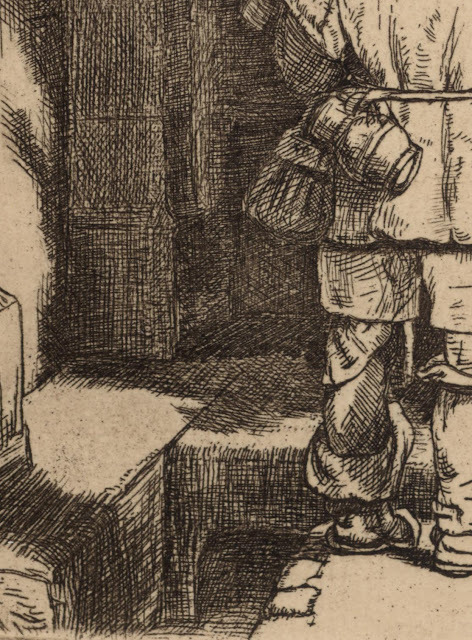 This print may also arouse a viewer’s interest at a subliminal level. For instance, the arrangement of shadow patterns in the image can be seen as a visual dialogue between the beggar group and the figure at the doorway. In this visual exchange, the shadow cast by the beggar woman’s cane on the man at the doorway (see detail below) connects her to him metaphorically as he is connected to her physically by his gift of a coin. Going further, a viewer’s attention is attracted to the pivotal moment of the gift by virtue of the beggars’ cast shadows framing a void of light immediately behind the hands that give and receive the alms (see detail below). As in all good storytelling, a critical ingredient that may be even more important than intrigue is the notion of suspending all thoughts beyond the addressed subject. 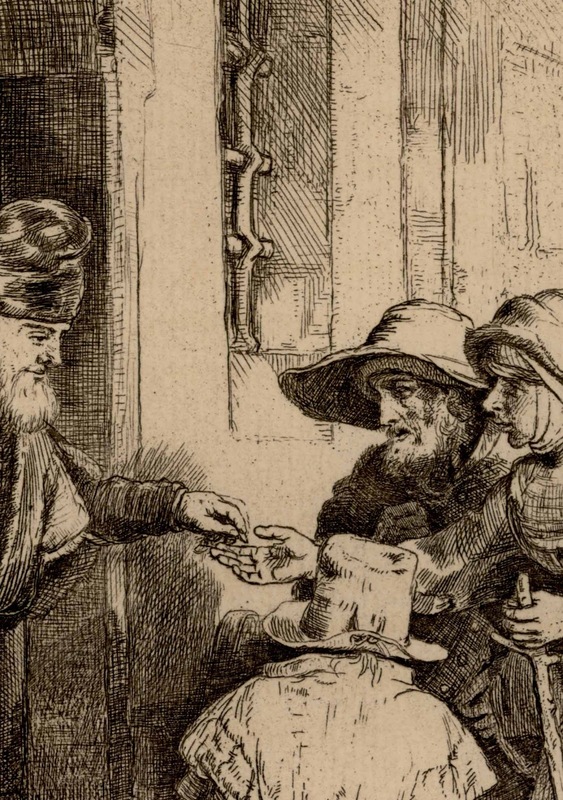 In Beggars Receiving Alms at the Door of a House Rembrandt removes irrelevant details to keep our interest focused on the essentials of what he portrays. 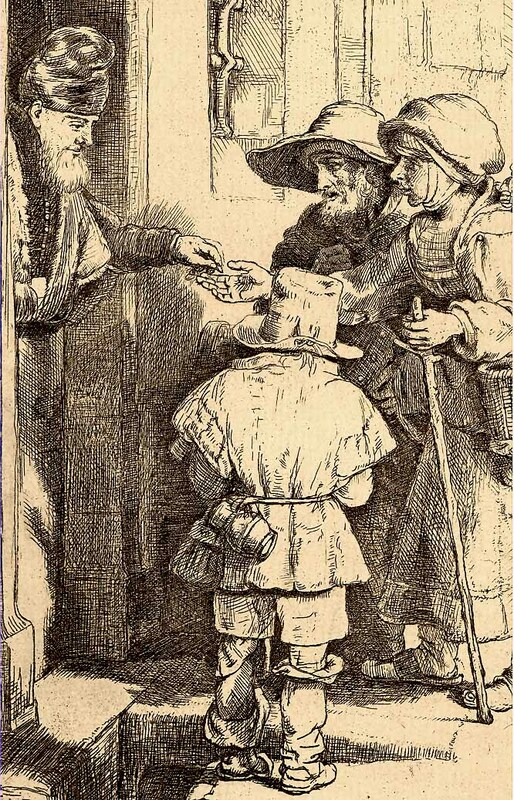 Just look at the figures’ eyes to see how the pivotal moment of giving is fine tuned. Moreover, consider how the background is only lightly sketched in so that it doesn’t distract from this moment.